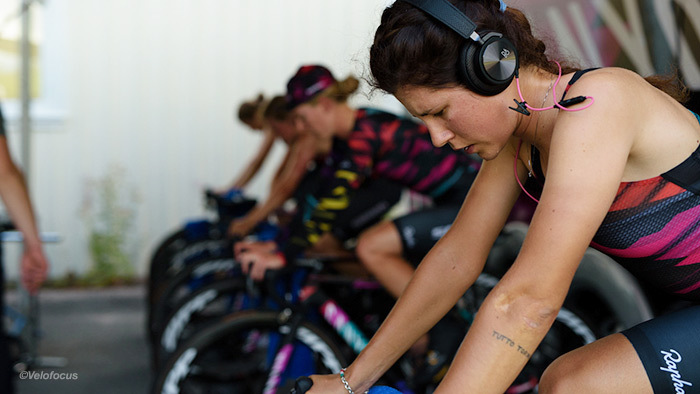 Now that you’ve successfully prepared for your first cycling race of the year, it’s time to dial-in how to warm up properly so all that hard work doesn’t go to waste. Preparing for a bike race involves more than training hard leading up the big day. Some good pre-planning is necessary to make sure you perform to the best of your ability on race day. Going into the event, you will need to know exactly what type of warm-up provides maximum benefit for the particular race. This question is best answered by knowing the type of race you will do and the area in which the race takes place. Once answered, planning your warm-up strategy becomes clearer. Some races require you to fire on all pistons from the start while other races allow you to ease into the pace. No matter the type of race, your body has to be ready to perform when called upon. As such, your warm-up is critical component of your overall race-day strategy. Almost as important as the warm-up itself, is the timing of your warm-up. When planning your warm-up strategy, plan backward from the start time. You want to finish your warm-up with minimal time between completion and getting to the start line. Too much of a time gap and your body cools down again. Too little time and you risk getting a poor starting position, which is critical in a criterium. Or worse, you miss the start! The warm-ups I have listed below range from 33 to 35 minutes. Allow 10 minutes after your warm up to do your final prep, then head to the start line. Do the math, plan your warm-up start accordingly. Next in pre-planning is where you will do your warm-up. There are some race venues that are not conducive to warming up on the road. If the race start is located in a highly-populated area or on a main road, there is a good chance you might need your trainer. Again, this is where the pre-planning comes in. If you have not done the race in the past, do some investigating to determine how you will do your warm-up. A trainer warm-up is more controlled. There are less variables to stress about; road obstructions, getting lost, etc. Some like to take the worry out and do their warm-up on the trainer exclusively. While others like to be on the road and get a “feel” for their bike before racing. If both road and trainer options are available, it comes down to personal preference. Different warm-ups are needed for different races. For races that are going to have an explosive start, a more aggressive warm-up is necessary. For example, the majority of criteriums start with a bang. Additionally, road races that have a hard hill within the first few miles would require an intense effort virtually from the start line. Short time trials and all cyclocross race starts fall into this category, too. If competing in any of the above mentioned races, your body is going to be put under a great deal of stress at the gun and will need to be ready to produce the expected effort immediately. Races that could have a more “casual” start, require less intensity in the warm-up. Longer time trials and longer or flatter road races are examples of a less intense start. For these types of races, the body still needs to be ready, but not as quickly. Your planned warm-up can be combined into the first several miles of the event in order to ease you into a race effort. Below are examples of different warm-ups for different situations on the trainer or the road. The answer lies in the time gap between the two events. Anything less than 30 minutes should not require a structured warm-up before the second race. Try to keep your legs moving a little between the two races. After you have rehydrated and refueled, get back on the bike and keep rolling around to keep your legs loose. Try not to let the muscles stiffen up. If there is a larger gap between the finish of the first and the start of the second, you can afford a little time off the bike between races. Again, replenish your body, then, with about 15 minutes to go before the next start, get back on the bike. Do 10 minutes ramping up from 40 to 70 percent of FTP. Then do three by 20 seconds at 105 to 110 percent FTP with 1:30 between efforts at 50 to 60 percent FTP. If it’s necessary to get back on the trainer, the same format can be followed. Your warm-up can make or break your race performance. Going to the start line with “cold” legs is likely result in a poor finish. By being detailed with your warm-up planning you have a strong advantage over your less prepared competitors. Make the most out of the hard work you have done and be ready when the whistle blows!